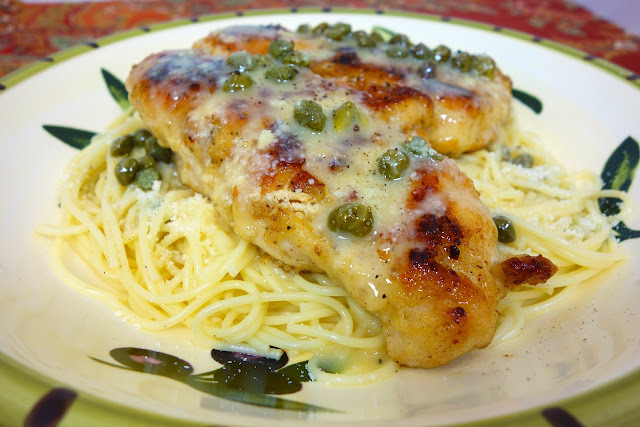 Chicken in Lemon Butter Caper Sauce - restaurant quality! You'll be blown away after one bite! 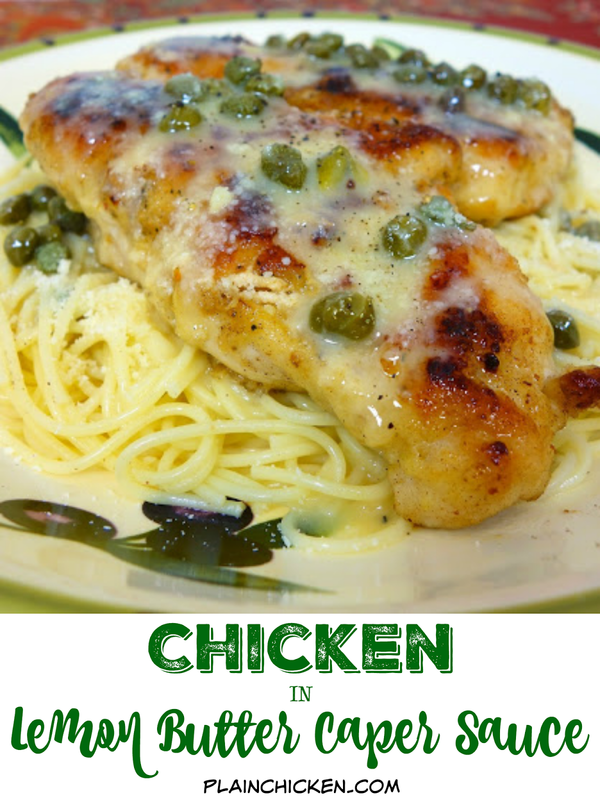 Sautéed chicken, pasta and a quick homemade lemon butter caper sauce. Ready in 15 minutes! Stop what you are doing right now and put this on your menu tonight. This was THE BEST thing I've eaten in recent memory - at home or in a restaurant. I've had this on my list of things to make since we went down to Destin at Thanksgiving. We had dinner at Ocean Club, one of my favorite places, and I had their chicken in lemon butter caper sauce. It was so delicious. I seriously considered licking my plate. It was the best thing I had eaten in a restaurant in years. This recipe is just as good as the chicken at Ocean Club. I couldn't believe that I made this at home for pennies on the dollar. Now, this is not a low-cal dish. This dish should be saved for a special occasion. I take the "Sideways" philosophy on special occasions - When you make this dish, that's the special occasion. Now go make it!. Cut the chicken breast halves horizontally, butterflying them open. Pound chicken pieces with a meat hammer to 1/4-inch thickness. Mix together the flour, salt, pepper, and grated Parmesan. Dredge chicken cutlets in the flour mixture, until well coated. Heat olive oil in a large skillet on medium high heat. Add chicken and brown well on each side, about 3 minutes per side. Remove the chicken from the pan and reserve to a plate. Cover with aluminum foil and keep warm in the oven while you prepare the sauce. Melt 1 tablespoon of the butter in a medium pan over medium heat. Add the onion and cook, stirring often, until the onion is translucent but not browned, about 3 minutes. Add garlic. Cook for about 30 seconds. Add the wine and lemon juice and bring to a boil over high heat. Cook until the liquid is reduced to about 2 tablespoons, about 5 minutes. Reduce the heat to its very lowest setting. Slowly whisk in butter, one piece at a time, letting the first addition melt before adding more butter. Season with salt and pepper. Stir in capers. Place cooked pasta on plate or pasta bowl. Top with chicken and spoon sauce over chicken and pasta. Mmm !!! Looks so good. Lemon, butter, capers - winning combination. Thank you for sharing. Girl that looks like something you eat at a restaurant. Totally putting this on our menu!!! Talk to me about the capers. I have seen them in recipes all my adult life, but have never had them. Would the dish be just as good w/o them? If your description of them doesn't sound appealing to me, could I add something else? Thank you !! Cece - you could certainly leave the capers out, but they give the dish a little saltiness. Capers are a berry - they are pickled, so they are a little salty. Make sure to wash them or they will be too vinegary/sour. I don't like tons of them, but I don't mind a few - especially in this dish. I can't wait to try this delish recipe! Capers are actually tiny flower buds, the smaller, the most desirable. If they continue to grow, they turn into Caper berries, which look very much like an olive. They are not olives nor peppercorns. Thanks for the recipe! Made this for dinner last night. It was delicious. I am watching my carbs, so substituted spaghetti squash for the pasta. Yummy! Thanks and keep the great recipes coming! do you have plenty of sauce for the pasta? i was afraid it might not be enough. julied - I did have enough sauce, but you could double it if you like lots of sauce. I might double it next time - the sauce was SO good. 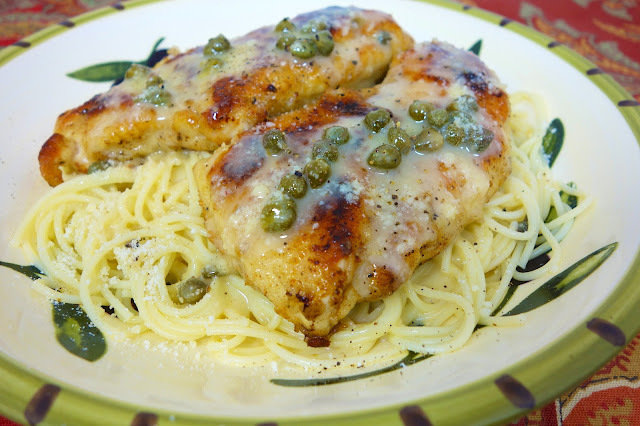 Now that's a good Chicken Piccata! Right you are. This is dinner tonight! What a great dish. We're having a party at Tumbleweed Contessa - Saturday Dishes. I'd love it if you would share that with everybody there. When I was first started dating as a teen, one of the first dishes I paid for was a chicken picatta like this and to this day it is still one of my favorites. Pinned this. I don't see any heavy cream or anything really out of the ordinary to make this a calorie loaded dish. I have made this before and totally loved it, wishing I had known about it before. Thanks. I think this is a lower calorie dish than I one I made previously. Sounds delicious! I've had something similar at a restaurant. Do you think it would work if I used chicken broth instead of the wine? What temperature do you set your oven at to keep the chicken warm? I love every recipe I've tried from your site! It should be fine with chicken broth. I make the chicken last, so it is warm. If you need to keep it warm, I would put the oven on the lowest setting. Love this type of dish. Capers and caper berries are favorites of ours. I always brine my chicken breasts in buttermilk for several hours up to all day before cooking them. So tender and juicy. I might add a little spinach at the end when I make it. Yum. I don't flatten my chicken but I add the wine and butter and lemon juice to the pan and cover it to cook. I use canned / jarred artichoke hearts instead of capers sometimes. We serve ours on rice a roni parmesian noodles. My husband and I were having a pretty yucky argument when I made this for him...I'm pretty sure it's what fixed things!! YAY! Good food can fix a lot! So glad y'all enjoyed it. My favorite meal is just this except stuffed with prosciutto and provolone. Its at Carrabbas and is called Pollo Rosa Maria. Love it! LOVE capers. They are pickled fresh (not dried) peppercorns! Pepper-y flavor plus salt flavor from pickling. Easy to find them jarred in pickling brine, but their flavor is truer (better) if you can find them salt packed. I had to order salt packed online. Some folks don't like the vinegary ones, but most folks like the salt/pepper flavor of the salt packed ones. Gotta rinse and drain before use with both types. I sneak them into a lot of bland foods for a little "Pop Zing"
Thanks Wende for the spaghetti squash idea to lower calories and carbs! Gotta try that. And Thanks Steph for this version with the breading - you've given me the idea to bread my breaded-chicken loving hubby's chicken breast, hope he might would like this version better than my version! There is nothing "plain" about this chicken! Your BBQ Ranch Grilled Chicken was such a success, we will try this one next. can I make this the day before?? This dish is so flavorful. Reminds me of a pasta salad I love, but the chicken is off the charts good. OMG! This was off the charts delicious! I kept the chicken warm in the oven while the sauce cooked. Then I put the chicken in the sauce while I drained the pasta, tossed the pasta in the sauce and we had ourselves a feast! Thank you, thank you!!! Very similar to Chicken Picatta. Tried tonight! Delicious. Only used 1T of lemon juice but plenty for us. Just a nice hint. I con fess I did add butter pieces faster but noticed no issue. I put 2-3T butter in at a time. No problems. Hubby said "This a keeper". BTW, he says that about every recipe of yours that I've tried. Thank you for another one! I so appreciate. I've had this pinned forever and finally got around to making it. Wow!! This is almost exactly like a meal from one of our favorite restaurants, except they add mushrooms which I did as well. I may double the sauce next time though as I love having enough to really sauce up the pasta. Definitely a keeper!!!!! Wow! This recompile was posted 5 years ago. I hope you receive my comment. I made this sauce and served it with salmon tonight. TO DIE FOR! I’m wondering what the best way to reheat this sauce would be? I have lots of left over, and can’t wait to eat it again tomorrow on some chicken! Forgive me. You must have skipped over my question above. What would be the best way to reheat the sauce? In past experiences with buttery sauces, the butter always separates, and it’s never smooth and creamy again. I haven’t reheated the sauce. I would suggest reheating slowing on the stove.